in the demonstrations organized against the pollution of the town of Yerevan there were heard challenges on the annexation of the Nagorno-Karabakh Autonomous Oblast (Province) of Azerbaijan and signatures began to be collected. the Karabakh Committee, which functioned illegally, in the underground, and the Grunk Committee, which was its branch, began to function openly in Khankendi. the extraordinary session of the Soviet of the People’s Deputies of the Nagorno-Karabakh Autonomous Oblast passed a resolution on the exclusion of the said oblast from the subordination of Azerbaijan and its inclusion to the administrative-territorial division of Armenia. two Azerbaijani youth were shot in the district of Askeran of the Nagorno-Karabakh Autonomous Oblast, it enflamed the development of events. the Supreme Soviet of the Armenian Soviet Socialist Republic satisfied the request of the Soviet of the People’s Deputies of the Nagorno-Karabakh Autonomous Oblast for being merged with Armenia. After the adoption of a resolution by the Supreme Soviet of Armenia on the annexation of the Nagorno-Karabakh Autonomous Oblast, the process of ousting by all means of the Azerbaijanis from the territory of the autonomous province speeded more. the detachments of the armed forces of the Soviet Union were ordered to occupy Baku and suppress the protests of population who organized demonstrations in the streets and squares of Baku and protested against the aggressive actions of Armenia which were supported and patronized by the leadership of the former USSR. It led to an unimaginable tragedy. in the building of the Azerbaijani mission un Moscow Heydar Aliyev made a decisive statement full of rage, the whole world listened to the echo which the statement caused. as a result of the open policy of aggression pursued by the Armenians the Azerbaijanis living in the villages and settlements of Karkijahan, Garadaghli, Malibeyli, Meshali, Gushchular and others located in the autonomous oblast were occupied. the geography of the military operations in the territory of Azerbaijan conducted by the Armenian armed detachments widened further and the districts of Azerbaijan were occupied one after another. when the town of Khojaly was occupied, over 600 people were brutally murdered, over 1 300 people were taken captives. a mediation process for the solution of the Armenian-Azerbaijani conflict began within the frames of the Conference of Security and Cooperation in Europe (CSCE). in the additional session of the Council of Foreign Ministers of CSCE held in Helsinki it was decided to convene a conference on the Nagorno-Karabakh in Minsk under the auspice of OSCE for the peaceful solution of the crisis as soon as possible on the principles, obligations and provisions of CSCE. Shusha was occupied by the Armenian aggressors; it allowed the Armenians to have control over the whole territory of the Upper Karabakh. the district of Lachin, which was located between Armenia and the Nagorno-Karabakh region of Azerbaijan, was occupied. Azerbaijan conducted successful military operations in the front, particularly in the direction of Gulustan and Aghdara, but this process was not continued till the end. the district of Kalbajar, which is situated beyond the boundaries of the Nagorno-Karabakh, was occupied. the district of Aghdam was occupied by the armed detachments of Armenia. the districts of Jabrail and Fuzuli were occupied by the armed forces of Armenia. the Armenian armed forces occupied the district of Gubadli. 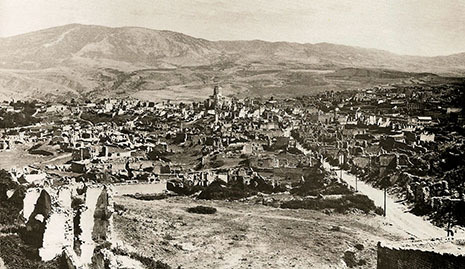 the Armenian armed forces occupied the district of Zangilan of Azerbaijan; it was the last occupationist operation of the Armenian army in the front. a ceasefire agreement was achieved between Armenia and Azerbaijan. the summit of CSCE in Budapest resolved to institute the co-chairmanship of the Minsk Conference in the frames of CSCE for the coordination of all the mediation efforts. – a guarantee for ensuring the security of Nagorno-Karabakh and of all its population, including a guarantee by all the parties to fulfil all the provisions of the agreement. the institute of co-chairs was set up, it consisted of France, Russia and the United States of America (since 1992 the Minsk Conference was chaired by Italy (1992-1993), Sweden (1994), Russia (1995) and Finland (1995-1996). , the co-chairs submitted a comprehensive draft of the agreement for the solution of the conflict over Nagorno-Karabakh. According to the said draft the armed conflict had to be ceased and an agreement had to be achieved on the status of Nagorno-Karabakh. Though Azerbaijan was ready to begin constructive consultations on the essence of the said documents, the Armenian side refused the proposal completely. during their visit to the region the co-chairs submitted new proposals for the solution of the conflict “stage by stage”. These proposals included the liberation of six districts from occupation, commencement of peacekeeping operations of OSCE, return of the internally displaced persons home and restoration of communication means in the zone of the conflict.